Andy: I will preface this review by saying I hate grapefruit. HATE IT. And that is all I taste in this rum. 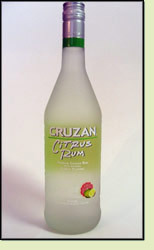 It says citrus…they might as well just call it grapefruit rum. Mixing with pineapple juice takes some of the harsh burn out of it, so now all you taste is grapefruit. Not so much for me. Adrian: This definitely has a citrus flavor. Mixing with pineapple juice really got rid of the burn to make a great drink. I really like it and would drink this on a regular basis. Just not straight.